The new RPHA (Revolutionary Performance Helmet Advantage) line of HJC helmets was created to bridge the gap between their current product line and other premium helmets on the market. 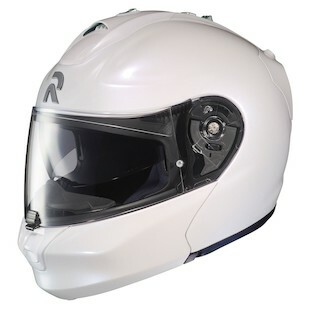 The HJC RPHA Max Helmet is the first modular with the styling and look of a full face sport bike helmet. It's constructed of carbon fiber, fiberglass epoxy, aramid epoxy and organic fibers, resulting in a strong and extremely lightweight helmet. In fact, it's the lightest modular helmet HJC has ever made! Some of the notable features include the integrated sunshield, Max vision shield with an included pinlock insert, RapidFire ll shield replacement system (ultra-quick shield replacement), full front to back airflow with lightweight, "Cool4Ever" moisture-wicking/antibacterial liner and is the 5 available solid color options. A full video review will follow as soon as we have the helmets in house.